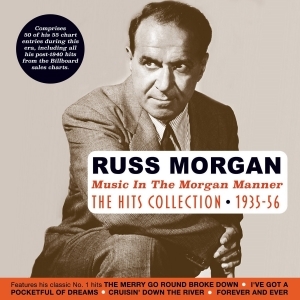 Pianist, trombonist, composer and arranger Russ Morgan was one of the most successful bandleaders of the 1930s and ‘40s, enjoying a string of big hits with his smooth, accessible easy-listening style which focused on the broad middle ground of popular music during an era when swing and other big band leaders were enjoying chart success with their more jazz-influenced styles. Growing up in Scranton, Pennsylvania, he played in a band called the Scranton Sirens with local contemporaries Jimmy and Tommy Dorsey, before becoming an arranger in New York and working with Jean Goldkette and Fletcher Henderson’s orchestras during the 1920s and early ‘30s. As musical director of a Detroit radio station he developed his trademark style of “Music In The Morgan Manner”, a phrase he used to introduce his orchestra on radio and at concerts, and on publicity and all his record labels. Encouraged by singer Rudy Vallee, he formed his own orchestra, and over the next two decades consistently had big-selling records, and by the time of his final chart entry in 1956, by which time rock ‘n’ roll had transformed the pop landscape, had had 55 hits. This great-value 50-track 2-CD set comprises the majority of those hits, omitting, simply for reasons of space, some recordings from the 1930s when there was no official sales chart, but including all his records which featured in the Billboard record sales chart. Featured among those hits were four No. 1s, “The Merry Go Round Broke Down”, “I've Got A Pocketful Of Dreams”, “Cruisin’ Down The River” and “Forever And Ever”, and it also includes his most famous composition “You're Nobody till Somebody Loves You”. It’s a nostalgic souvenir for anyone who was around during those years, but for any fan of sophisticated and stylish easy-listening music this provides some evocative entertainment from those golden years.